Prince Harry has been reunited with his fellow South Pole adventurers who revealed that he has a special skill essential for expeditions – latrine building. 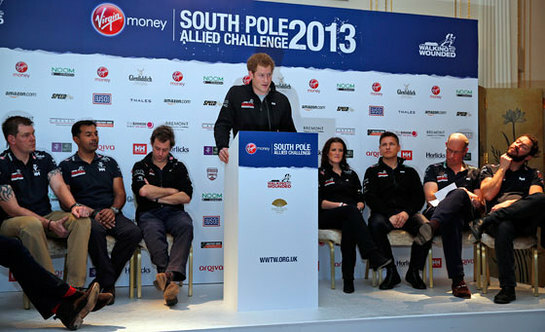 Prince Harry speaks at the Walking With The Wounded South Pole Allied Challenge welcome home press conference. At a welcome home press conference, Prince Harry met up with some of the men and women with whom he trekked across the frozen wastes of Antarctica to reach the most southern point of the globe. Among those on the Walking With The Wounded South Pole 2013 expedition were 12 injured servicemen and women from the UK, US and the Commonwealth – and The Prince praised their efforts as an “unbelievable achievement”. Surrounded by his fellow trekkers, Prince Harry spoke about the Walking With The Wounded charity that organised the challenge to the South Pole. He said: "Inspiring others is one of the corner stones of this charity, to demonstrate to those who have experienced life-changing injuries that everything is possible. “I hope this truly unbelievable achievement by everyone behind me, and back in America, Canada and Australia… will remind everybody that they can achieve anything that they want to. The adventurers faced such extreme weather conditions during their 200-mile (322km) odyssey that organisers had to call off the competitive element of the trek. But working as one unit, the UK team and squads from the US and Commonwealth made it to their Antarctic goal together on Friday December 13. His Royal Highness was the official patron of the gruelling trek and the challenge was filmed for a documentary that will be screened in the spring.